The perfect size for that special little place. This unique product can be used anywhere in the house from on the mantle over the fireplace, to your child's nightstand, to a shelf in your bathroom. 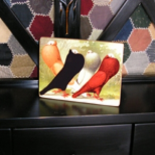 These 5x7 standing boards come on 1/4" wood and come with a stand attached to the back. The back is painted with signiture gold. Most collections come lightly glittered( glitter can be omitted upon request).